As we continue counting down to Smallville: Absolute Justice, more and more teases are being trickled out, including this chest-thumping shot of Hawkman and Green Arrow at each other's throats. Absolute Justice's screenwriter Geoff Johns promised us animosity, and animosity we have! We also have our first looks at Dr. Fate and Stargirl, which can be seen here. Overall, I like the look of their costumes. Courtney's domino mask is a little too clunky and chunky, but otherwise she is represented well. Fate looks pretty much as I expected him to look, and I am very satisfied with it. 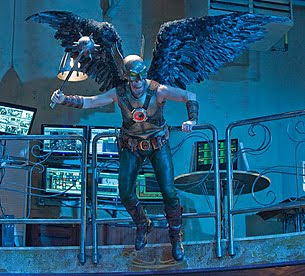 As to Hawkman, this image shows off Michael Shanks' build much better than the first one did, as well as showcasing the texture of the helmet and costume. I am more enthused by this image than the previous one. This image also reminds me of this scene from early on in Volume 4, heh. Smallville: Absolute Justice airs on February 5, 2010, and this Hawkman cannot wait! Image: Hawkman and Green Arrow from Smallville, 2009, image obtained from Blog@Newsarama. As I mentioned earlier, my family and I are heading out of town tonight to head down to Florida to spend the holiday with my wife's family. I'll be back next week, and hopefully actually have something to blog about. Happy Thanksgiving everyone! Well, my wife, son and I are heading out of town for the holiday tonight, so you get the Hawk-related titles a day early this week. Of course, I won't get to read them until next week at the earliest, but them's the breaks. Blackest Night #5 -- No doubt that the reanimated corpses of Carter and Kendra will play a role in this comic, the first installment of the second half of Blackest Night. I'm pretty sure Johns has some utterly evil stuff up his sleeve to spring on us all. Green Lantern #48 -- I have not been following the tie-in titles to BN that I was not already reading, but I know in one of them we saw the Black Lanterns of Khufu and Chay-era, and they could show up here. Justice League: Cry For Justice #5 -- The end of the last issue had Green Lantern and Green Arrow's little group running afoul of the Justice League, who for some reason at the beginning of this title had both Hawkman and Hawkgirl in it. So hopefully we can see them all throw down with that lovely Cascioli artwork. More teases for the upcoming Smallville: Absolute Justice telefilm were provided, appropriately, from the teaser trailer at the end of last week's episode, which can be seen here. Points of interest include glimpses at the Sandman, Alan Scott's Green Lantern ring, the JSA's meeting table, and this portrait showcasing the Golden Agers in all of their glory. 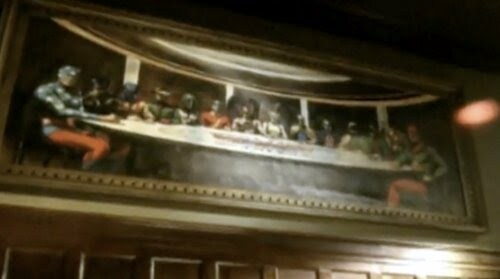 Right in the middle, of course, are Hawkman and Hawkgirl, though they are slightly obscured here. They're flanked by Jay Garrick and Dr. Fate. Between the new information provided here and what we already know, this is shaping up to be one nerdtacular event. Image: Smallville: Absolute Justice trailer screencap, 2009, retrieved from Speed Force. The oft-mentioned upcoming Smallville feature event starring the Justice Society now is "officially" a telefilm. Say hello to Smallville: Absolute Justice. Sources confirm to me exclusively that The CW has jettisoned the separate titles that were initially assigned to each of the two episodes — "Society" and "Legends," respectively — in favor of the singularly sensational (and far more marketable) Smallville: Absolute Justice. 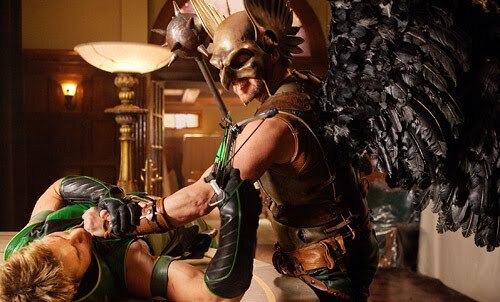 What's more, I hear the movie — which marks the debut of Michael Shanks as Hawkman (pictured) — will air as a seamless two-hour event with only one set of credits. This sounds more awesome with every little snippet which is released! Mark your calenders for Feb 5th! Do we have any new Hawk-merch coming out this week? Let's check it out! JSA v.3: Thy Kingdom Come Part 2 -- This collection finishes up the "Thy Kingdom Come" storyline and leads the way into "In The Name of Gog," which was Geoff Johns' penultimate arc on this title and the last one for Hawkman. There's some good stuff in here, and is definitely worth checking out. Justice Society of America 80 Page Giant #1 -- I haven't been reading JSoA since Johns left, so I am not really sure what is going on at the moment in the title. But the JLoA 80 Pager was a nice treat, and there is always the possibility of this taking place before Carter and Kendra sloughed off this mortal coil. Check it out folks, we've got a first look at Michael Shanks as Carter Hall, AKA Hawkman, from Smallville's upcoming feature-length Justice Society adventure. I am pleased with how the helmet and wing harness look, but Shanks looks like he needs to beef up a little bit. Maybe it's just the picture, but he looks a little too scrawny to wield that mace effectively! Otherwise, I have only minor complaints, which is tantamount to "where are the stripes?" I don't mind the breastplate look, and the presence of the chestpiece is excellent. I guess the real test will be when the rubber hits the road, so to speak, when it hits the airwaves. TV Guide: What's Hawkman's story? Michael Shanks: When we first meet Carter Hall he's in his museum. (Luke sez: HECK YES!) We'll learn he's a reincarnated prince from a thousand years ago. There is a reference to The Justice Society's time in the '70s, but we have since disbanded. TVG: Is there any reference made to Hawkgirl? MS: There's a lot of referencing to Shayera/ Hawkgirl throughout as his one true love, given the fact that these two have a tremendous history as thousand year-old reincarnated beings who continue to find each other lifetime after lifetime. And we will learn where she is now. I don't know that I can get any more jazzed up to see Hawkman on the small screen at this point! The special is set to air February 5, 2010. I got put on to this postcard by Shag over at Firestorm Fan, and it certainly is a nice image. I wish I could find a bigger copy, but you make do with what you have sometimes. Anyway, I really like the symmetry which Perez uses here. Besides their arms and wings, notice how the strip on the right boots line up, and then is nicely broken up on the left. I also dig Shayera wielding the big two handed axe! 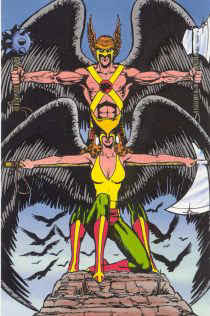 Image: Hawkman and Hawkwoman postcard, 1984, George Perez, image retrieved from Cosmic Teams. Thanks to rob! over at The Aquaman Shrine for passing along this little beauty, a Superfriends "hobo bag" of all things! Unfortunately, the bag itself is no longer available for purchase, but you can still see some more pictures here. It's unfortunate that bufoon Green Lantern is jutting his elbow in front of Hawkman, but I think Katar will get Hal back later at the JLA's "two hand touch" football game! Image: Superfriends "hobo bag," 2009, image retrieved from The Aquaman Shrine. Hawkman's Smallville Epsiodes Now a Telefilm? According to the crew over at Blog@Newsarama, the upcoming Geoff Johns-penned Smallville episodes featuring Hawkman -- entitled "Society" and "Legends," respectively -- are now going to air as one two hour telefilm. This comes on the heels of the previous announcement that Pam Grier (yes Coffy herself) will be playing the role of Amanda Waller in these episodes. While I was a huge fan of CCH Pounder as "The Wall" on Justice League, this casting seems like a shoo-in as well. This reall is great news! I can't think of another time when characters as deserving as Hawkman, Dr. Fate, and Stargirl will get so much exposure. I am very pleased to see the extra attention given to what is shaping up to be a very promising pair of episodes. Hopefully CW (and maybe DC) will hype this as an "event," which, given the presence of the Winged Wonder, it most certainly is! Do we have anything new featuring the Winged Wonders in store this week? Let's have a look and see. Absolute Justice HC -- I'm personally waiting for a softcover version, so I should be reading this Alex Ross take on the Superfriends sometime next decade. But that's alright, since this looks pretty timeless anyway. Green Lantern Corps #42 -- The Black Lantern Khufu and Chay-era or Carter and Kendra could pop up here, although I have not been following this title so I am not sure. REBELS #10 -- Similarly, the space heroes could have to deal with our zombified heroes, but they seem to have their hands full with Starro at the moment! Summary: Carter Hall is paying a visit to his friend Elwin Thayer, who has been acting strangely. While on his way, though, Carter finds Elwin's daughter Teddy on the side of the road! She tells Carter that her father has been receiving death threats, and locked himself in the library and sent her away. They go to the house to find Thayer murdered, and the priceless Everest Emerald stolen. Dropping Teddy off with Shiera, Carter investigates as Hawkman. Meanwhile, we see that it was Elwin's brother Edward who is the murderer -- somehow he created a disembodied hand (which can speak!) to do his bidding. He killed his brother for the Emerald (and estate) in order to impress his girlfriend Sandra. As Hawkman investigates the grounds, the girls arrive with similar intent. All three of them see the Hand, sent by Edward to kill Teddy, though they are able to avoid it. Hawkman trails the hand back to Edward's apartment, and finds him dead -- killed by Sandra's thugs! Hawkman takes out the thugs (with a timely assist from the Hand), but is shot in the shoulder by Sandra. The lady killer then finds Shiera and Teddy outside, and takes them hostage. Recovering, Hawkman and the Hand agree with to work together. As Hawkman grabs the girls from the car, the Hand strangles Sandra, and the two drive off a cliff. Back at the Hall place, Teddy chides Carter for not being brave like Hawkman. Review: This is a bizarre one. We never quite learn just how the hand was created, no how it manages to speak. Add to that a lot of confusing coloring, including people's clothes spontaneously changing colors from panel to panel, and Sandra completely changing her appearance halfway through the story. Still, it's amusing enough, including Teddy's admonishment of Carter as a "fraidy cat," which reminded me of the classic "Where were you when Superman was here, Clark?" motif. The Moldoff cover is nice, but once again not connected in any way to the story. 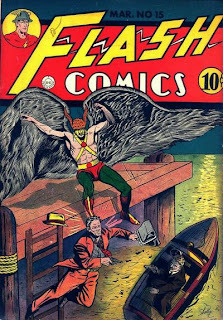 Image: Flash Comics #15, 1941, Sheldon Moldoff. Do we have any Hawk-related stuff to look forward to at the LCS this week? Let's find out! Superman: World of New Krypton #9 -- Last issue detailed a clash between the New Kryptonians and... a race vaguely resembling Thanagarians. I am not sure what the heck Robinson was trying to pull off with the Thanagarian dialect being spoken, but it didn't work. They haven't been portrayed that way, well, ever. And if it was military slang, it was laid on too thick to be really believable. The Wingmen slang from Hawkworld was pretty well developed by Truman, and would have made more sense. "Devils!" for instance. About the only one I liked was the use of "Grand!" as a modifier, which struck me as similar to the use of "prime" on Transformers: Beast Wars. Anyways, needless to say I didn't care for the Thanagarians last time out. This issue features alien badass Jemm, Son of Saturn, but it may also include the Thanagarians as well. Alright, folks, I'll post the tidbit excerpted over at the Comic Reel at Comic Book Resources, but I am not clicking through to that site. The management of Being Carter Hall does not endorse or support The Huffington Post in any way, and makes no claims or guarantees on the content of the site should you choose to click the above link. "I have yet to shoot a frame of film on this episode. This is what I've been doing the most of, is going for fittings and you know, talking to the producers about the character and discussing the elements of the voices. But mostly it's been focused on the costume and the logistics of the costume. Again, it's a necessary thing. I really appreciate the reverence that these guys have." Also, Shanks (unsurprisingly) confirms that he is playing Carter Hall, archeologist, and not Katar Hol, Space Cop. I say "unsurprisingly" because Geoff Johns is writing his appearances! Smallville has been on an upswing through last season into this one, so I am very much looking forward to seeing the Society pop up over on "Earth-CW." Thanks to Shag over at Once Upon A Geek, here we have a "Batcomputer" card from Justice League of America monopoly (essentially a Community Chest card). Evidently, this is the only appearance Hawkman makes in this set, which is disappointed as That Goateed Moron Green Arrow rates a lot more, including getting a game piece! Ah well, those morons in marketting don't know what they are doing. At least the Winged Wonder's card pays out some cash. 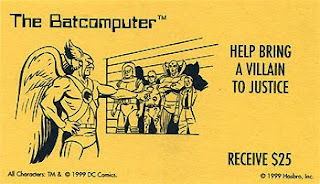 Image: Justice League of America "Batcomputer" card, 1999, retrieved from Once Upon A Geek.